The City of New York has adopted over 150 master plans for our neighborhoods. You can see which areas have been affected and what those grand plans were here. Neighborhood master plans - often called “urban renewal plans” - were adopted to get federal funding for acquiring land, relocating the people living there, demolishing the structures and making way for new public and private development. Plan adoptions started in 1949 and many plans remain active today. Development in the plan areas sometimes happened, like Lincoln Center, and sometimes didn’t, like many still-vacant lots in East New York and Bushwick. Areas were selected for renewal because they were considered blighted or obsolete. The “blight” designation always came from outside the communities that got that label - from inspectors working for the mayor’s Committee on Slum Clearance in the early period and Housing Preservation and Development (HPD) employees in the later period. 596 Acres has teamed up with Partner & Partners and SmartSign to produce a comprehensive online map showing all the adopted neighborhood master plans for New York City. It has taken us nearly two years to follow up on a Freedom of Information Law request for records of those plans and meticulous translation of paper plans into machine-readable spreadsheets to make this map. Image manipulated by Andrew Tucker. These plans have existed in paper form in HPD’s offices, but have been inaccessible to the public until now. 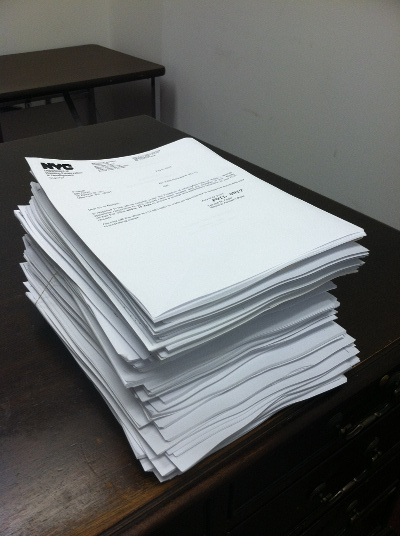 Our request for access to the agency records was granted in 2012 and we opted for the right to inspect these records instead of having the agency make copies for us at 25 cents per page. Our team of trained volunteer records inspectors examined each plan and listed all the lots that were included in it, including the dispositions that were promised where those were available. These volunteers spent over 100 hours inspecting the records. A few plans were completely missing from the stacks that HPD provided, so our research team looked for them in community archives and on the internet. Photo by Paula Z. Segal. Every property in the city has a specific number assigned to it - a borough, block and lot number (BBL). The BBLs created using the above process were mappable (using MapPLUTO) only where they did not change since the plan was adopted. Many plans or other developments changed these numbers, for example, when a number of small lots were merged to become a larger lot. Where we could, we also captured what form that renewal was meant to take in the form of “dispositions,” or planned uses for the land. Our map lets you search for lots that were designated for “open space,” “residential” or “commercial” uses, among others. Only some plans were this detailed, so not every lot has a specific designation. For example, some plans listed potential uses for the plan as a whole but did not assign specific uses on a lot-by-lot basis. In other plans, lot dispositions were not legible on the paper maps provided. Searches with our tool do not include lots such as these that lack specific designations. However, some lots were intentionally assigned multiple uses such as “residential and commercial,” and these lots will appear in search results for both “residential” and “commercial” dispositions. The data on this map is hosted on CartoDB, and we’re grateful for the space they provided for this project. If you would like to find data for a specific borough or plan, you can find the data on GitHub. Sign designed by Partner & Partners. Photo by Paula Z. Segal. 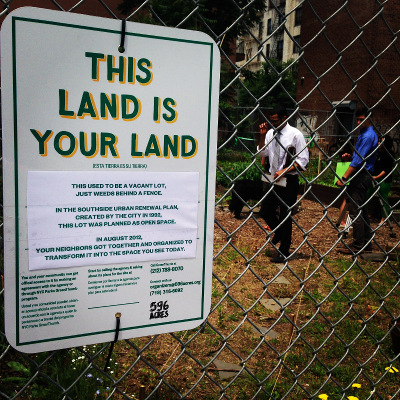 The Keap Fourth Community Garden in South Williamsburg was a vacant lot two years ago that we noticed was part of an Urban Renewal Plan and designated to be Open Space. The 596 Acres team put signs on it and helped folks get together and they got no resistance from the relevant agencies. It has been transferred to Parks and there was a formal ribbon cutting on June 4, 2014, more than 20 years after the lot was planned as Open Space. 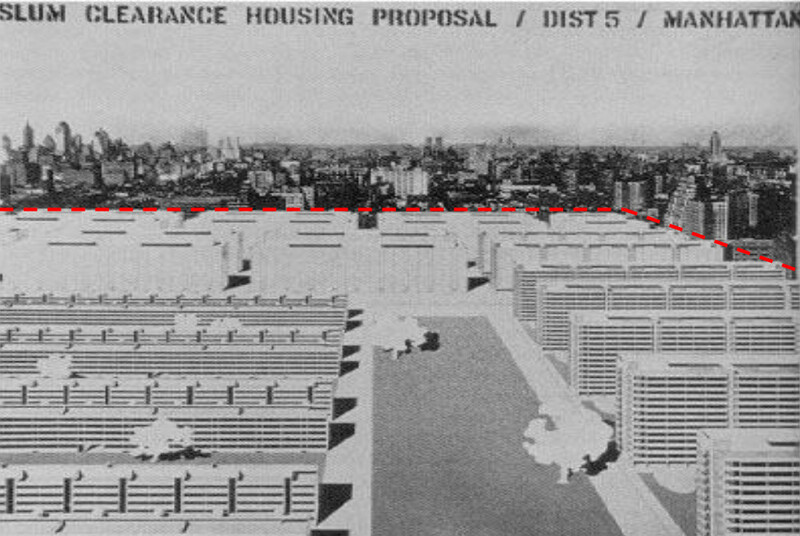 The Edgemere Urban Renewal Plan (Queens) contains dozens of lots planned as Open Space. Last year, we put signs on the set of the lots that was designated as the Edgemere Urban Renewal Park in the plans. Today, neighbors who saw these signs are running the Edgemere Farm. Eric Brelsford, 596 Acres, is a computer programmer and mapmaker. He worked on most of the processing that went into the data behind this site, from cleaning the data to turning the data about each parcel into something that could be put on a map to putting the data on this map. Eric tries not to miss an opportunity to make a map that helps us understand the space around us, particularly in New York. Mapping urban renewal has been a unique opportunity to link the history of this space with the present and future of it, whether through 596 Acres or other community-driven efforts. Blair Brewster is the founder and CEO of SmartSign, a company with deep roots in Brooklyn. Blair has seen firsthand both the upside and the devastating downside to urban renewal projects. His first business - in North Adams, MA - was adjacent to a swath of commercial building blocks that were knocked down in the name of urban renewal; 40 years later, they remain largely empty. On the other hand, near his longtime home in Brooklyn Heights, the community was able to combine land held by a combination of city agencies, building a garden, playground, basketball court and Brooklyn’s first community dog run. Disconnected and unloved shards of land can become invaluable community resources. Blair proudly supports 596 Acres’s efforts to spread information with the power to change our cities. Charles Chawalko performed digital cartography and data corrections in the production and visualization of the map. His interest in the project came from his own thesis work and struggle concerning the potential privatization of his Mitchell-Lama cooperative that was born out of the Brooklyn Bridge Southwest Urban Renewal Plan. It is with hope in unveiling these hidden histories associated with urban renewal plans that we can secure spaces while creating new futures for them. Matt Delsesto has been working on this data liberation mission since the summer of 2013 when he first encountered the overwhelming stack of urban renewal plans on the 6th floor of Housing Preservation and Development offices. He became excited when he recognized streets on pieces of paper in the windowless room, and learned that if we think our neighborhoods are missing pieces, it’s because they probably are. Mariana Mogilevich is an urban and architectural historian and native New Yorker. She writes about the design and politics of the built environment in general and on public space and open space in New York in particular, and has taught urban studies and architectural history at Harvard and New York University. Greg Mihalko, Partner & Partners, is the designer on the project, working on graphic and interaction design for the website and identity. He’s excited to visualize how the city has been planned, built and shaped into what it is today. Zach Mihalko, Partner & Partners. Paula Z. Segal, 596 Acres, is the founding director of 596 Acres. For many years, she lived in a neighborhood full of holes in North Brooklyn. Now, she’s doing something about it. Merran Swartwood joined the project in November 2013 as a data-gathering robot and became part of the website team, to which she contributed much discussion and some copywriting. She misses the weekly security checks at the Department of Housing Preservation and Development and the monthly pies at 596 Acres. & a team of volunteer plan inspectors: Mary Bereschka, Charles Chawalko, Matt DelSesto, Suzan Frazier, Anandi Gandhi, Sophie Maguire, Alexander Roesch, Paula Z. Segal, Zaina Shahnawaz and Merran Swartwood.